Stylish and attractive, the Kastel Donjon is a constant companion. I’m always on the lookout for a better, more efficient, useful and stylish bag to carry my MacBook Pro, iPad 3, and various electronic accoutrements, including an external battery, noise-cancelling headphones, and a ton of different cables to power and charge everything in there. I also like to add a paperback book, various papers and flyers (if I’m covering a conference) and room to drop in a little reporter’s notebook, a pen or three, and a digital audio recorder for interviews. Oh, and it helps to have an easy pocket to slip my iPhone 6 Plus and wallet in if I need to go through security at the airport. The Kastel Donjon bag is a European-style messenger bag that meets all these needs in an attractive, useful way. 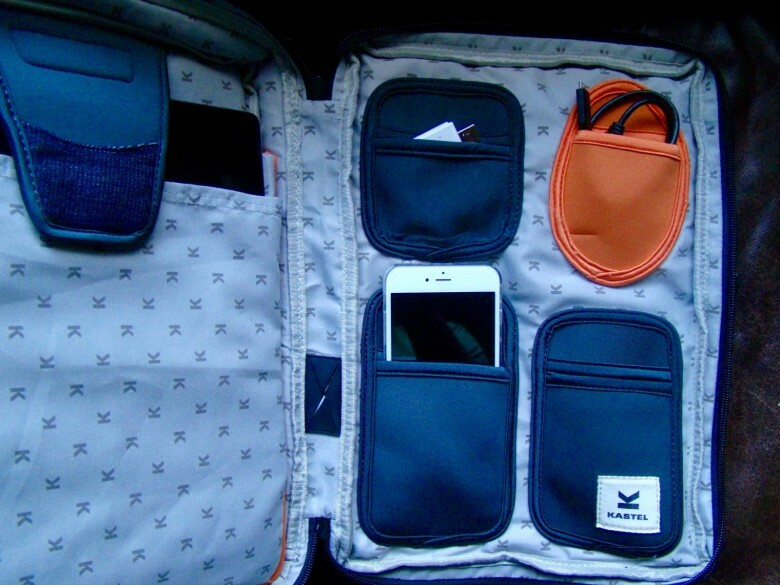 The interior has several pockets, making organization a treat. 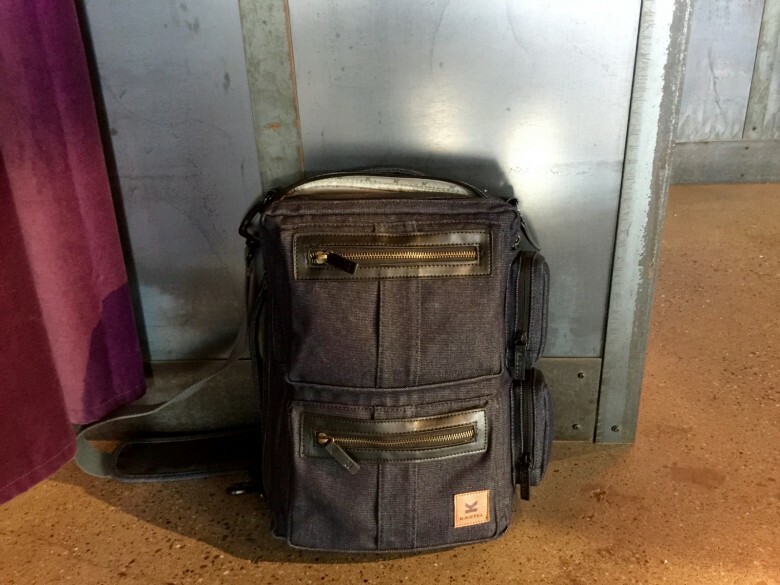 The 13-inch blue denim version of the bag I tested is at my side all the time now, and I use its dedicated external zippered pockets and inner sections for laptop, tablet, and small items to make sure I’m always ready and always organized. The neoprene inner pockets hold SD cards, iPhones, and external batteries easily and let me grab them at a moments notice without having to dig through a ton of cruft at the bottom of the larger area. The front of the bag has another large zippered area for papers and books, and a smaller zippered pouch just inside. The very front of the bag has two more smaller zipper pockets where I tend to stash things I need ready access to, like business cards, small notebooks, or my wallet. Also? What kind of bag comes with a dedicated rain cover that folds up easily and sits in a dedicated tiny side pocket? This one does. The two side pockets give the Donjon its distinctive look, as well, in any orientation. The Donjon comes with a shoulder strap that lets you hang the bag off your back, messenger-style, but it also can be attached to the shorter top edge, letting you wear it like a single-strap backpack. It even has a clever waist strap for when you want to carry it in this “portrait” orientation.The Donjon is a versatile, soft, pleasant looking messenger bag that will keep all your stuff carefully seated and organized, no matter where or how far you plan to go. The Donjon is available in 13- or 15-inch sizes, and comes in black leather, light gray canvas, and the soft blue denim I tested. For about $124 (or $10 more for the 15-inch Donjon), you’ll get a fantastically designed and incredibly functional bag that will meet all your needs for a protective and stylish messenger bag that should be equally at home at the office or on your bicycle.